The store consolidations in Buffalo, N.Y., improved dealer profits and sales. In 2006, Ford dealers in Buffalo, N.Y., suffered from Rust Belt disease: Too many dealerships, too few customers. Following a plan sketched on a place mat -- which Ford now considers a national template -- dealers developed a formula to buy out other Ford dealers willing to sell. Some dealers won, some dealers lost, when the roster of Ford stores shrank from 15 to nine. Here is their story. BUFFALO, N.Y. -- In 2006, Chuck Basil's toughest competitors were the other Ford dealers surrounding his metro Buffalo store. The solution: Pay them to go away. It worked. "Best investment I've made," says Basil, 53, a dealer's son who bought his own Ford store in his 20s. Basil, who played a key role in the consolidation plan, has kicked in a total of $500,000 to buy out three dealerships in Buffalo. And profits at Basil Ford in Cheektowaga, N.Y., have soared. Basil had been urging Ford Motor Co. to consolidate for years, to no avail. By mid-decade, half of the Buffalo area's Ford stores were losing money in a troubled market. In 2006, after years of falling market share, the automaker relented. With moral and financial support from Ford Americas chief Mark Fields, the dealers acted. In the broad sense, the venture was a success. Even dealers who went out of business say the Buffalo area and the surviving Ford brand dealerships are better off because of the five buyouts and one closing. Still, there are scars and casualties. Today, while one prominent dealer expands his building to the edges of his property, a former competitor across town paces his empty store, wondering how to sell property already in bank foreclosure proceedings. Profits are up for both the group of Buffalo dealers and Chuck Basil, a dealer instrumental in developing the market's consolidation plan. In the end, deals are about money, and self-interest makes them happen. But chemistry is crucial, too. Vital to the success of the Buffalo plan was the competitive camaraderie of the Buffalo dealers. They battle each other for business -- sometimes sue each other. But they also attend games of the National Hockey League's Buffalo Sabres together or go charter-boat fishing for lake trout on the Niagara River. Years back, some attended the local Jesuit high school together. "We scratch our heads sometimes, too," Basil says of the unusual dynamic. "It's a Buffalo underdog thing. We've been in this constant recession for so many years, so we band together. We can't afford to be outright enemies." Buffalo's economy eroded in the late 20th century. Bethlehem Steel closed a massive complex on the Lake Erie shore. The population dwindled as young people left. The dealers' unusual chemistry, forged by Buffalo's Rust Belt decline, helped pull them together at the exclusive Buffalo Club in the fall of 2006. "It all happened on a place mat," recalls Pete DeLacy, the third-generation operator of DeLacy Ford in the southeast suburb of Elma, N.Y.
DeLacy and several other dealers stuck around after a dealer advertising group meeting at the swanky club co-founded by Millard Fillmore, the nation's president in the early 1850s. The group included eventual survivors and some who would close. Among the dealers was Basil, one of six brothers selling a rainbow of brands around the Buffalo area. With Basil scribbling on the place mat, the dealers roughed out a buyout formula and a plan for calculating each dealer's contribution. Participating dealers would end up paying a closing dealership $1,000 for every new car sold the previous year. Ford, in a key pledge, would pay another $1,000 per car. Although the per-car formula held up, not every dealer contributed to every buyout. In some cases, up to eight dealerships pitched in. In others -- typically with smaller stores on the fringe of the market -- a single dealership nearest in proximity paid the entire amount. In addition to Ford's worsening sales crunch, there were reasons that the meeting happened when it did. Critical among them was a change of heart at Ford. For years, the automaker had blocked Buffalo dealers' requests to consolidate. The Ford mantra: We need to keep every point we have. But with national market share in free fall and dealership profits plummeting across the country, that was about to change. Early in 2006, at the National Automobile Dealers Association convention, Mark Fields had told dealers Ford would consider cutting dealerships. Five months into a job leading Ford's Americas operation, Fields had found dealers in trouble across the nation. "He's the guy who said this is a problem we need to address," says Basil. "He's actually the guy who got the budget in Ford to get this done." In late summer 2006, Ford sales chief Cisco Codina announced Ford's support for consolidation in major metro markets. Dave Kelleher, the executive Ford picked to manage the program, visited the Buffalo dealers for ideas but provided no template for trimming dealerships. Weeks later at the Buffalo Club, the plan was born. Eventually, six Ford stores would die, five of them in buyout deals. Dealers in Buffalo ended up receiving $250,000 to $1.9 million to give up their franchises. Jack Adkins Ford, the biggest dealership to shut down, was the trial case roughed out on the place mat at the Buffalo Club. It would be the first to close with a buyout. 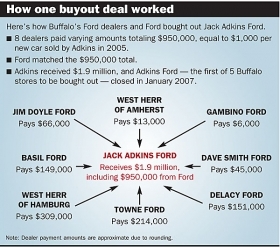 In 2005, Jack Adkins Ford in Lackawanna, N.Y., sold about 950 new cars -- largely because it was near Ford's Buffalo stamping plant. The factory stands in an industrial area overlooking the eastern shore of Lake Erie. A banner on the plant can be read by passing boaters. In that part of Buffalo, called the Southtowns by locals, Ford dealerships benefited from employee sales. Buffalo is a factory market. Ford dominates in the Southtowns. With several General Motors Co. and Delphi plants, GM business dominates the Northtowns. Adkins was doing OK, but the owner's health problems and the dealership's proximity to several other stores made Adkins a likely first candidate to go. A stroke had put Jack Adkins in a wheelchair in the late 1990s. He semiretired to Florida and left day-to-day oversight of the dealership to General Manager Charlie Pfeil. By 2006, Pfeil signed most of the papers and generally acted as the dealer. When Ford signed off on the consolidation strategy, the company and dealers talked with Pfeil -- who talked with Adkins, then in his early 70s. Adkins said yes, and his store closed in January 2007. It was the market's first and biggest buyout -- about $1.9 million contributed from the dealers and Ford. "He couldn't have gotten that in blue sky from anybody in the world, what he got paid," says Pfeil, 64, who now works for the area dealers association. "It was amazing." Blue sky is the intangible value of a dealership. But if that first deal went smoothly, Tony McCarthy's story was a textbook case of how a deal could go sour. In the fall of 2006, employees asked McCarthy whether the rumors that McCarthy Ford was closing were true. "Should I get wheels for my toolbox?" a tech asked. McCarthy, whose store was struggling and was in line for a buyout, wasn't about to lie. Probably, yes, McCarthy told his workers. And what's more, other Buffalo Ford dealerships would close, too. Try to find new jobs as quickly as you can, he said. They did. And within two weeks, the Southtowns dealership in Elma, N.Y., effectively was out of business, at least two months before McCarthy had planned. It didn't help that employees at another dealership posted signs around Elma hinting at the closure. Either way, with just McCarthy; his wife, Bernadette; and three remaining employees, the store lacked staff to stay open. And that's when the sucker punch landed. The closing chatter had started after several other area Ford dealers had agreed verbally to pitch in money to buy out McCarthy's store. With the business unraveling, McCarthy said he began sensing uncertainty from the other dealers. He stopped paying Ford Motor Credit Co. Now out of trust, the store didn't last long. The buyout fell apart. He promptly filed lawsuits against his fellow dealers, contending they should have paid him under the pending arrangement. The suits were settled this fall for an undisclosed amount, although McCarthy says legal bills gobbled up most of that settlement. Meanwhile, his life took a surprising turn best described later in this story. 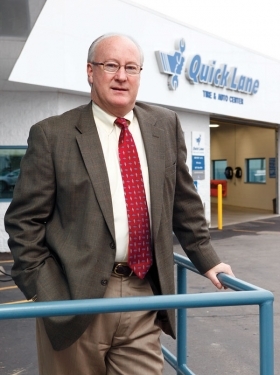 Jim Doyle's buyout led to a new life as a dealership general manager in Florida. Doyle had purchased Jim Doyle Ford in Kenmore, N.Y., from his father. He initially made the business grow, but Ford's slide in the 2000s and Buffalo's economic woes hurt business. At his location in the Northtowns, Doyle had fewer employee sales from the Ford stamping plant than some other dealers. Doyle paid about $66,000 into the Adkins deal. But he realized little benefit. Six months later, in June 2007, he agreed to his own buyout and shut his doors. Doyle moved to Orlando for his new job. He says he thinks it's "great what happened for the guys" who survived. "I got a fair deal, and I'm happy with what I'm doing," says Doyle, 47. His was the second buyout, and three more would follow. That, plus the McCarthy closure, dropped the roster from 15 Ford-brand dealerships in 2006 to nine today. Sales per dealership and dealership profits are up, Ford officials say. The Buffalo market might be furthest ahead, but Ford is slashing its national dealer ranks, too. The automaker has cut 673 domestic-brand dealerships since the end of 2005. The roster stood at 3,723 stores as of March, Ford's most recent accounting of locations. Ford calls Buffalo a case study for how consolidation should work. Says Fields: "It's a great template to use going forward." Ford says all surviving Buffalo dealers are making money. The profit margin for the group went up sharply. New-car sales per dealership in Buffalo rose 25 percent from 2006 to 2008 versus a 20 percent drop nationally. Ford's biggest fear -- that market share would continue to atrophy -- was allayed that first year after consolidation began. National share continued to slide, but Ford's Buffalo share jumped by more than one percentage point in 2007. Since then, share has dipped, standing at 13.8 percent through the first nine months of 2009. Over the past four years, Ford's share falloff in Buffalo is narrower than the brand's share drop nationwide. Not all surviving dealerships would talk about the effects of consolidation. But several indicated the closures have been a boon. At Basil Ford in the central Buffalo suburb of Cheektowaga, revenue jumped 38 percent in 2007, Chuck Basil says. New-car sales spiked 50 percent in 2007 before moderating with the industry sales downturn. In 2007, the year Adkins and Doyle closed their stores, Basil Ford had its most profitable year ever. And even with the industry collapse, dealership profits in 2009 are ahead of 2007, Basil says. He won't share dollar figures but notes that per-car profits are up $700 from 2006. As with the place mat negotiations at the Buffalo Club, Basil was the group's numbers guy on some other buyout deals. A high-energy multitasker, Basil works his BlackBerry and jots memos on sticky notes while he answers questions. He prides himself on recordkeeping and organization. When he momentarily loses track of a years-old file, it drives him batty. "I'll be awake all night," Basil says as he searches his orderly office for the missing record. Basil's father, Joe Basil Sr., was still a young dealer when Chuck got to high school. There were seven kids in the family, so Basil paid for half of his pricey private high school and college tuition by working. His college job: Buying trade-ins from area stores and selling them to others. In 1985, at age 28, the younger Basil bought the Ford store. These days he's not all work. Basil got his pilot's license a year ago. He flies a single-engine Cessna to Rhode Island, where his 48-foot boat is docked, and cruises the Atlantic for vacations. Sitting in his Elma store decorated with Buffalo Bills memorabilia, dealer DeLacy says the consolidation has "made the rest of us stronger. Less players mean bigger slices of the pie." DeLacy spent $300,000 on the buyouts. At age 43, he considers the outlay an investment in the future. It's a gamble, but one DeLacy expects will have the same upside as the risk his dad took in 1979, when the family dropped its Chrysler shingle in exchange for the Ford franchise. Dealers say that in addition to Basil, two other dealers were key players in the consolidation. Scott Bieler of West Herr Automotive Group -- Buffalo's largest Ford dealer, with two suburban locations -- contributed the most money to the buyouts. He wouldn't talk about the impact of consolidation on his business. Another key player was Frank Downing, 46, president of Towne Auto Group. He runs Towne Ford, the area's second-largest Ford store, in the Southtowns community of Orchard Park, about five miles from Ford's stamping plant. Towne Ford became one of the central destinations for former salespeople from closed dealerships. Seeing potential in the orphaned customers those employees could bring with them, the gregarious Downing hired seven. Towne spent more than $500,000 on buyout incentives, and business is better for it, says Downing, a second-generation dealer who has known his fellow dealers for most of his life. In between working on the Ford national dealer council and playing two weekly hockey games, the one-time University of Michigan hockey captain stays in touch with both the survivors and former dealers. After the consolidations, Towne Ford sales jumped from 1,000 new vehicles annually to 1,764 in 2007. Downing figures he will sell 1,500 this year. Profits have doubled, he says. But in the GM territory of the Northtowns, the consolidations lacked the same boom effect. As the economy worsened, some dealers had little choice but to agree to buyouts. That aptly describes Gambino Ford in Lockport, N.Y. The store was bleeding money. And in December 2008 -- on the "worst day of my life," says owner Pat Gambino -- he told employees the store would close that month. Gambino built a $2.7 million service center in 2000, but business had dropped by half since the beginning of the decade. The debt payments were out of reach. Gambino had contributed to some of the early buyouts and wanted desperately to stay in business. But he ultimately wound up on the receiving end of a buyout. Because of his location on the edge of the market, only one nearby dealer and Ford pitched in the entire amount. Now Gambino is trying to figure out what to do with his empty property, with its empty saltwater aquarium and the Christmas tree still standing from last December. Meanwhile, in the venerable honeymoon mecca of Niagara Falls, the recession has masked some of the payoff that Steve Baldo anticipated for his Ford store. Lacking proximity to Ford's factory employees and the closed dealerships, Baldo hasn't seen the surge that surviving Southtowns stores have. But Baldo expects to come out a winner in the end. He plans upgrades to his aging store next spring, to take advantage when the economy recovers. He figures the market will continue to be healthier because of the store closings. Says Baldo: "With consolidation, now you can see the daylight." The most recent closure happened in September with the buyout of Upstate Ford, a small rural store southeast of Buffalo. Some dealers think the market is probably done consolidating; others say it would be better if more stores closed. They note that Mark Fields has said his metro sales-per-store goal is to get Ford numbers close to Toyota. 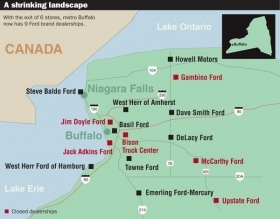 In the Buffalo area, Toyota has five stores, compared with Ford's nine. But some things are still the same. Dealers and former dealers still hang out. Gambino and Downing and their families spent the long Columbus Day weekend together in the nearby ski town of Ellicottville, N.Y.
And McCarthy, who lost his store in 2006 when employees left en masse, is still selling Fords in the Southtowns of Buffalo -- but as a sales manager, not a dealer. Downing hired McCarthy early in 2007. They work in side-by-side offices at Towne Ford -- even though McCarthy, in light of the buyout dispute surrounding his failed store, filed suit against Downing and other Ford dealers soon after taking the job. Downing says he paid the lion's share of the undisclosed settlement. McCarthy sold his dealership property at a huge loss. He's still trying to clear bank and tax issues and says he will be dealing with the legal and financial aftermath of the dealership's closing for the rest of his life. McCarthy says he's not bitter. The store provided a nice life for his family and got his daughter and son through pricey Syracuse University. The store failed, but he's not looking back. "Lifewise, nothing changed," he says from his office at Towne Ford where Yankees memorabilia blankets the wall. Behind him sits a small green plaque that reads "McCarthy Ford." It once stood at a community skate park sponsored by his former dealership. While he'd still rather have his dream job of playing center field for the Yankees, McCarthy says he enjoys working with Downing. He says he misses the days when McCarthy Ford was his family's gathering spot. "I liked what I was doing better before." But McCarthy adds: "We're doing fine. There's more to life than Ford. There's more to life than a Ford dealership."